From what I played yesterday, ZombiU might just have the most unique boss battles of any game on Nintendo's upcoming WiiU console. That's because I essentially got to be the boss—sending out waves of the undead to kill human beings—in Ubisoft's cleverly asymmetrical survival horror shooter. Saying that I was the boss was a bit of a misnomer, bonestly. I wasn't the end-of-level bad guy that needed to get taken down to get to another part of the game. What actually happened was that I and another member of the press were facing off in ZombiU's competitive multiplayer. This mode lets one player use the Wii Pro controller to control a human while another uses the system's GamePad to become a sort of zombie general. The goal in the game's multiplayer is to be the first person to capture an set number of flag across the map. 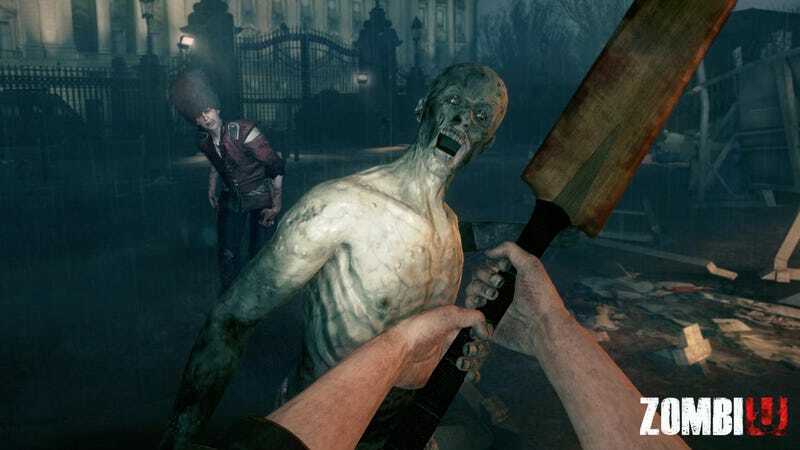 The human Survivor side of ZombiU plays much like a typical first-person shooter. You can wield a pistol, shotgun, crossbow and other weapons to blast at the brain-eaters and when the zombies get close you, you can do a quick melee shove to give you some room. But once they grapple onto you, one bite turns you into one of them. The only way to kill the undead abominations is to stab antiviral syringes into their necks. As you can probably guess, those syringes are going to be in short supply. It's going to take careful movement across the blasted London terrain to get to each capture point. As a human, the action's fast and a bit disorienting, mostly because your opponent can pepper the environment with zombies in hard-to-predict fashion. You never know if the next corner or hallway holds a zombie hungry for your cerebellum. Playing as the Infected side in ZombiU, I got a top-down perspective of the map and heads-up display of the various different zombie types I could deploy against the Survivor. You can only place zombies on certain parts of the map, which prevents the Infected from just plopping an undead enemy right behind a Survivor. The zombie types on hand all have different abilities and uses. Guards will protect the points you've already secured, Hunters will seek out the Survivor wherever he is on the map and Grunts are the only shamblers who can capture the key points in the environment. Infected players won't be able to spam opponents with their hordes, though. You'll only be able to spawn 10 zombies at a time and an energy counter on the left hand side of the controller screen counts down every time you spawn a zombie. Certain zombie types use more energy so you'll need to be strategic about what kind of flesh-eater you drop into the fray. Human Survivors are able to claim capture points faster than Infected but of course are in constant danger. Being in charge of the Infected serves as a nice showcase of Nintendo's two-screen philosophy for the WiiU. After you look at the GamePad screen to make your moves, it's very satisfying to look up to the bigger TV display and see your minions wreak havoc on your uninfected enemy. There won't be any online play for this multiplayer mode, though. Representatives from Ubisoft's Montpelier studio said that they feel the mode works best when both players are in the same physical space able to gloat and trash talk as the tide of battle turns either way. Right now, ZombiU looks like a first-class example of the kind of inventive design ideas that Nintendo claims will be possible on the WiiU. I liked being the Zombie King and look forward to unleashing more hell when the game comes out later this year.